Seven months after collecting his fifth straight win, Costa Philippou has finally been issued his next assignment. 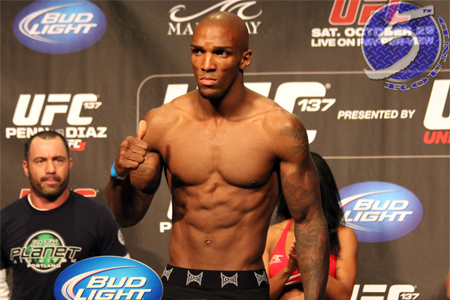 On Tuesday, it was announced the middleweight will battle up-and-comer Francis Carmont (pictured) at UFC 165. Air Canada Centre in Toronto, Canada hosts the September 21 event. Philippou was last seen posting a TKO victory over Tim Boetsch at UFC 155 in December. The 33-year-old hasn’t lost a bout since dropping a unanimous decision to Nick Catone in March 2011. Carmont, thus far most famously known for being training partners with reigning welterweight king Georges St-Pierre, is perfect through is past 10 scraps. His last five fights took place inside the Octagon. No word if the 185-pound affair will appear in the main card or prelims.